A team of researchers led by Justin R. Crepp, the Freimann Assistant Professor of Physics at the University of Notre Dame, has directly imaged a very rare type of brown dwarf that can serve as a benchmark for studying objects with masses that lie between stars and planets. The team’s paper on the discovery, “The TRENDS High-Contrast Imaging Survey. V. Discovery of an Old and Cold Benchmark T-dwarf Orbiting the Nearby G-star HD 19467,” was recently published in The Astrophysical Journal. Data came from the TRENDS (Targeting benchmark-objects with Doppler spectroscopy) high-contrast imaging survey that uses adaptive optics and related technologies to target older, faint objects orbiting nearby stars. Brown dwarfs emit little light because they do not burn hydrogen and they cool rapidly. Crepp said they could provide a link between our understanding of low-mass stars and smaller objects such as planets. HD 19467 B, a T-dwarf, is a very faint companion to a nearby Sun-like star and is more than 100,000 times as dim as its host. Its distance is known precisely, and the discovery also enables researchers to place strong constraints on important factors such as its mass, orbit, age and chemical composition without reference to the spectrum of light received from its surface. Precise radial velocity measurements were obtained using HIRES on Keck Observatory’s Keck I telescope. The observations, which span 17 years starting from 1996, show a long-term acceleration, indicating that a low-mass companion was “tugging” on the parent star. 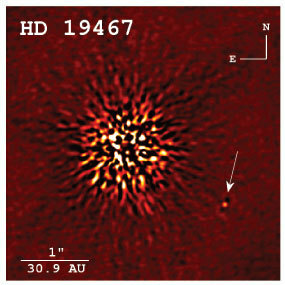 Follow-up high-contrast imaging observations were then taken using NIRC2 on the Keck II telescope with the adaptive optics system in 2012 revealing the companion as shown above. Observations were granted through each of the Keck Observatory consortium members, including NASA, the California Institute of Technology and the University of California. While scientists understand the light received from stars relatively well, the spectra from planets is complicated and little understood. Understanding brown dwarfs, such as HD 19467 B, could be a step toward a fuller understanding of exoplanets. Originally published by Gene Stowe at news.nd.edu on January 20, 2014.